Grey seals (Halichoerus grypus) are found on both shores of the North Atlantic. They feed a variety of fish, mostly benthic or demersal species. During the winter months, female grey seals in Nova Scotia haul out on beaches such as Hay and Saddle Islands to start pupping. 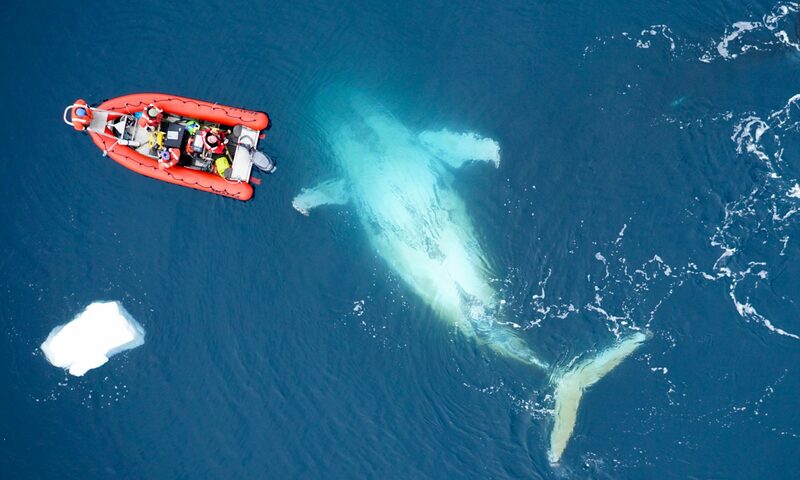 Females usually give birth about a day after coming ashore. Pups are born with a white woolly coat, which it will shed after about a month and grow dense waterproof adult fur. Female grey seals nurse their pups for about three weeks, until they are left to fend for themselves. The pups rapidly fatten up on their mother’s milk due to its extremely rich fat content, which is about 60%, the highest of all mammals. Once they are fully molted the pups leave for the sea to learn to forage for themselves. Although seal hunts for grey seals have not occur in the last couple of years, they have been going on for many years, and are still going on for other species, such as harp seals. The Canadian Department of Fisheries and Oceans (DFO) regulates the seal hunt in Canada. DFO studies and monitors the seal populations, set the TAC (total allowable catch), monitors the hunt and works with the Canadian Sealers’ Association (CSA). CSA helps to train sealers on new techniques and regulations to ensure the hunt is done humanely. Sealers use clubs or a ‘hakapik’ to avoid damage to the pelts. A ‘hakapic’ is a seal hunting tool that has a hammer head and a hook that are used during the hunts. There are controversies surrounding this method. The Canadian government states that it is humane, while animal rights advocates say an alarming number of seals are still alive and responsive to the pain while they are skinned. Sealer hunters are prohibited from killing seal pups, which have not yet shed their white coat. Sealers also tend to not hunt adult seals because they are harder to hunt. I’ve been reading The Devil & the Deep Blue Sea by Linda Pannozzo. In this book she delves into the mismanagement of the cod stocks and the misguided blame of seals for this situation. The Canadian government initially attributed the collapse of the cod fishery, and the failure to recover years later to the growing seal populations in the region. This has ultimately lead to a decision to authorize a large-scale grey seal cull to ‘fix’ the problem the seals caused the cod stock in hopes for its recovery. The cull has not happened yet, and it is unclear if it will. 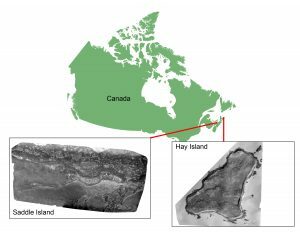 Hay and Saddle Island are located off the coast of Nova Scotia, Canada. DFO monitors the grey seal populations through traditional methods. They use planes or helicopters to fly over the rockeries taking photographs using SLR cameras. 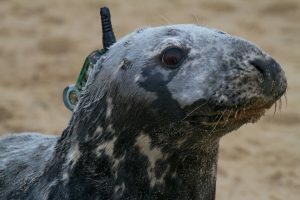 By exploring the benefits of using the small unmanned aerial systems, we should be able to develop a more time and cost effective method to monitoring seals that is safer for scientists and a more efficient at collecting data. The Sensefly eBee was flown above Hay and Saddle Island to photograph the islands using different types of cameras. I am using the photographs taken by the eBee, to conduct a population count of the grey seals on Hay and Saddle Island. By utilizing a program called iTag I am able to count the adults and pups by placing a dot on the adults or a square on the pups. 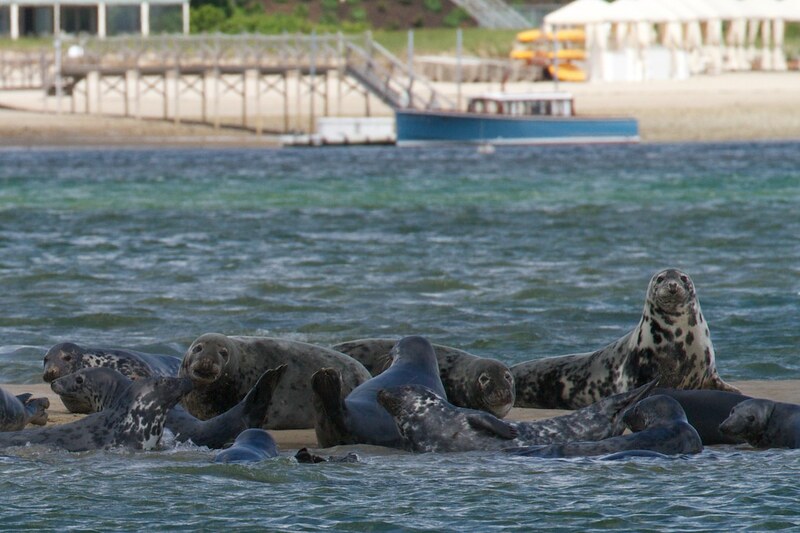 Once I have tagged all of the seals in the photograph the program will give a total count of animals. This program is very easy and efficient to use. This in combination with using the eBee will make monitoring populations much simpler and effective than the traditional methods used today. Previous PostPrevious I didn’t crash it! !